Hi everyone! Today I have a special polish to share with you. A little while back I had this custom polish made by Girly Bits Cosmetics in honour of my baby's first birthday! You might have seen that I had a custom polish made for when she was born. I have a bottle for me and a bottle for her. This custom is the same and I'm slowly but surely starting a special collection for her! Here in France, Sophie la Girafe is a must-have baby item. I really like the character and line of products. Everything is so cute yet simple. I decided to make a Sophie la Girafe birthday cake for my little girl for her first birthday so it seemed fitting for this custom to be Sophie-inspired too! Pam created this gorgeous soft yellow crelly with brown, copper and pink glitters in it, inspired by Sophie's 'spots' and pink cheeks! I wanted the polish to be quite delicate and 'babyish' like Sophie and I really love how it turned out! I used 2 coats plus topcoat. What do you think of it? Do you have any special custom polishes? Hi everyone! 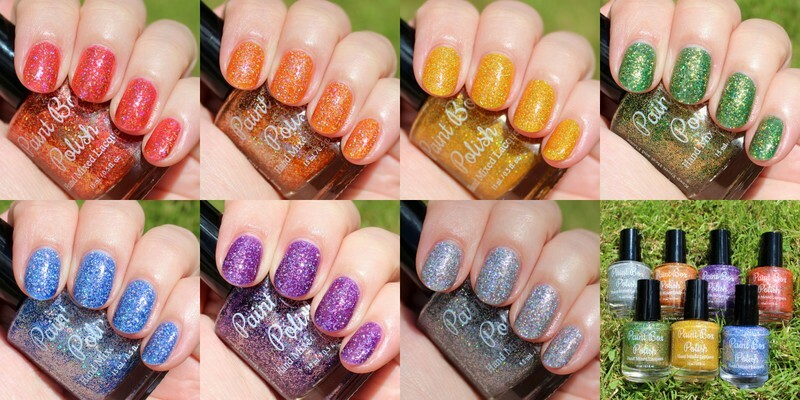 Today I have the Paint Box Polish Westerosi collection to show you! The collection is made up of 7 full coverage holo glitter polishes inspired by Game of Thrones. I'll admit that I don't watch Game of Thrones but I have to admit, I always see everyone talking about it and I'm maybe slightly curious as to what I'm missing, even though the very first episode made me think it wasn't for me. I do however love polish of course and was excited to try these out! Dracarys is an orange as bright as the fire unleased by Daenerys Targaryen’s dragons! 2 coats and topcoat. I'm not usually the biggest orange fan but this is juicy and so sparkly. Stunning for summer. Gold Shall Be Their Shrouds is inspired by the fierce Lannisters and their love for all things gold. 2 coats and topcoat. A sort of surprise favourite for me from the collection. Along with orange, yellow usually isn't one of my preferred colours but this one I really love! It is bright and juicy. Apparently glitter changes my mind! I Want To Be THE Queen pays tribute to the green and gold colors of House Tyrell and Queen Margaery. 2 coats and topcoat. Easily one of my favourites of the collection if not my absolute favourite. Pam does greens so well and this is no exception. The Purple Wedding was a momentous event that deserves a tribute polish. 2 coats and topcoat. You have probably seen me wear this polish before. It started out as a custom for a friend of mine and I'm happy it is being released for everyone. It's lovely! Wight Eyed Walkers is as steely blue and glistening as the eyes of the Night King himself. 2 coats and topcoat. Another favourite for me. The glitter really shines in this one! Winter is Coming. What else needs to be said? Grey with silver holo is as Stark as it gets. 2 coats and topcoat. A nice change from the regular silver holo polishes with the grey base. This one will be good for leadlighting etc. Concerning the formula and application on these, they are all quite similar. A few of the colours are a little thicker than others (Winter is Coming, Wight Eyed Walkers) but all are good and apply easily. Depending on your application, they are opaque in 2-3 coats. As I mentioned I used 2 which was perfect. You certainly don't have to sponge them on but you could for an even blingier result. I also wanted to mention Pam's newly released Like Lightning Quick Dry topcoat as well. I purchased it when it went up on her site because I have been waiting FOREVER for a 5-free indie quick-dry topcoat. I have trouble with shrinkage with most quick-dry topcoats (Seche, Poshé etc) and have been using Revlon for a long time. I do like the Revlon a lot but I am glad to have a great indie alternative with a thicker texture for glitter especially. I have had nothing but good results so far. Being 5-free it has no bad smell which is a major problem for me with many topcoats (and non 3-free polishes in general) so I don't have a headache and no shrinkage! I'm a fan. Like Lightning retails for $6.00 for a 15 mL bottle. This collection will be released at noon EST on June 30th. They will retail for $10.00 for the 15ml bottles and $6.00 for the 8ml luxe minis and you can use the code THEMANICAFE for 15% off your order! Hi everyone! Today I have a super simple mani for you but one I really enjoyed wearing! I started out with 2 coats of Girly Bits I AM Calm from the Hocus Pocus Fall 2015 collection. This is a 'deep wine jelly, with fine glowing red/gold shimmer' and it is exactly the type of colour I love. Dark and glowing. The formula and application were great, no comments in particular to add there. To add a bit of nail art without covering too much of the base colour, I decided to do an accent nail. It seems like forever since I did accent nails rather than full manis of nail art and I forgot how much I like them as well. I used Cirque Halcyon and a dotting tool to make a chunky leopard print design. I like the rose gold against the red and it's a nice change from colour combinations I might usually wear. I'm literally obsessed with Cirque Halcyon. I wish it hadn't been limited edition. What do you think of this mani? Are you more into accent nails or full manis of nail art? Hi everyone! Today I have a mani with my first ever Femme Fatale polish to show you! I have admired the brand's polishes for a long time and finally picked one up when I was shopping at Girly Bits for peel-off basecoat! Pam has recently started carrying both Dance Legend and Femme Fatale products which is awesome! I was a happy bunny to get a Dance Legend Peel off base and this stunner from Femme Fatale called Stargazing on Saturn. This is the March Colour of the Month and is described as a 'sparkly navy crelly with copper shine, red sparks and fine silver holo microglitter'. I'd say that it is maybe more teal, at least on me and the copper shine is amazing and what made me have to try it! I used two coats of Stargazing on Saturn and the formula and application were just perfect. I know I don't have any other Femme Fatale polishes to compare but this makes me want to try more for sure! I then used a thin coat of topcoat to create a totally smooth surface for nail art. The holo glitter looks slightly gritty without but smooths over with just a thin topcoat. I then used Essie Penny Talk, my clear stamper and Moyou Enchanted 16 plate to stamp this geometric design. It reminds me of space/stargazing and goes well with the theme here! I then finished with another coat of topcoat! I love how Penny Talk matches the copper in the base! What do you think of this mani? Are you a Femme Fatale fan? I certainly think I'm a new one! Hi everyone! Today I have a couple of manis to show you which I had been meaning to do for ages, ever since picking up the Gwen Stefani palettes by Urban Decay. The eyeshadow palette (white packaging) and blush palette (black packaging) were released in collaboration with Gwen Stefani and they're both really lovely. 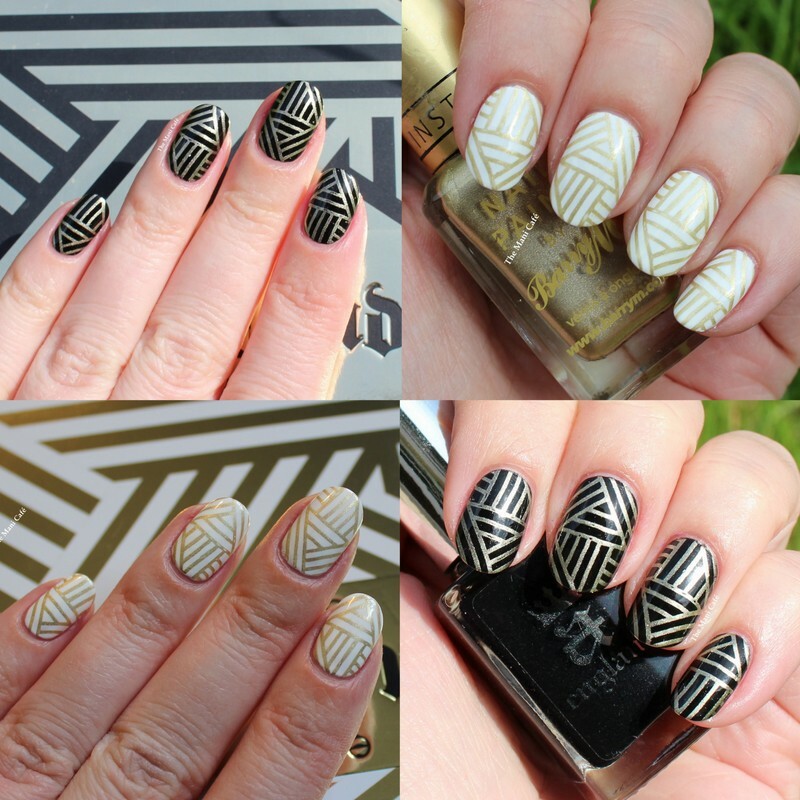 I was excited to create some nail art inspired by the bold white/gold and black/gold packaging. I was happy to find a stamp by Moyou which is quite similar to the overlapping stripe design on the palette boxes. I started out my white mani with 2 coats of OPI Alpine Snow which is a real favourite of mine with a great formula. I then used a gold Barry M polish (Foil Effects 320) and Moyou Holy Shapes 01 plate to stamp. I finished off with topcoat as always. For the black mani, I used A England Camelot and the same Barry M gold to stamp with. I like how these turned out and it was fun matching my nails to something so closely. What do you think of these? Which one do you prefer?